Disclaimer: I'm not a dentist, you'll hear and read conflicting opinions about probably everything involving tooth care, so feel free to do your own research and consult a dentist or doctor you trust! Coconut oil has a bad reputation with pipes because it can solidify (we've never had a problem) and if you'd like to avoid it, consider a tooth powder. Soon after getting married in May of 2012, I felt led to switch the personal care items in our home to "less toxic" products. Shampoo, lotion, deodorant and everything else went under evaluation so that better alternatives could be sought out. When it came to toothpaste, we first purchased a kind made by Dessert Essence because it was free of fluoride and sodium lauryl sulfate (SLS). I accidentally ordered fennel flavor, and it was a HUGE adjustment. Minty fresh was a thing of the past; the strong smell of black licorice reassured me that my husband had brushed his teeth! I soon learned through deeper research that glycerin (an ingredient in the Dessert Essence toothpaste we had switched to) is actually thought to contribute to tooth decay when used as a toothpaste additive. Furthermore, the Dessert Essence toothpaste we'd switched to contained sodium coco-sulfate, which is very similar to SLS. Basically, the Dessert Essence switch was a beginner's mistake on my part. It SEEMED better, and in some ways it was, but there are definitely better options yet! In my "refuse to accept anything but the least harmful" fashion I decided that I needed to find that better option. Thus, Earthpaste entered our lives. At first I hated it. It has no foaming agents, so... it doesn't foam. Which might be hard to imagine if you've only ever brushed with conventional toothpaste. It felt like I was brushing with minty water. Pleasant flavor, unappealing texture. However, we stuck with it, and actually grew to love it. I honestly think I would gag if I tried to use conventional toothpaste again. We also asked our dental hygienist if it would be detrimental to our teeth to switch to a fluoride-free toothpaste. Her answer? We could brush with water and maintain good dental hygiene. According to her, oral health has much more to do with the frequency and thoroughness of brushing and flossing than it does with the toothpaste (or lack thereof) being used. Side note: We use an electric toothbrush. When I try using Earthpaste on a conventional toothbrush, I hate it just as much as I did the first time I tested it. I personally believe using an electric toothbrush gets your teeth cleaner, but it also makes using an unconventional toothpaste more palatable! Now, to the whole point of this post! Earthpaste is awesome (maybe), but it's rather expensive. It literally contains seven easily attainable ingredients. Why not try to recreate it at home? 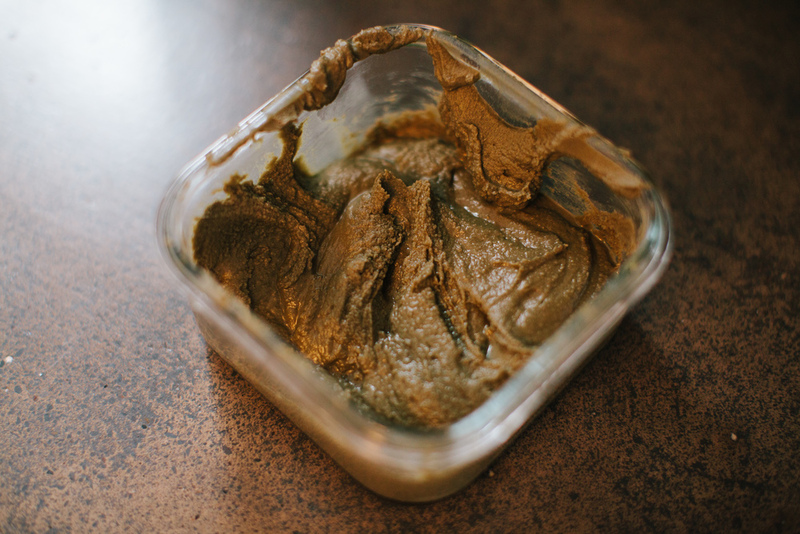 I made a some substitutes and added a few ingredients that Earthpaste doesn't have, but the recipe below works well for us and we're happy brushing our teeth with it. I hope you're inspired to try this homemade version or experiment to find a toothpaste recipe that you love! Play around with ratios, feel free to leave out the sweetener (it's just for taste anyway) and let me know if you come up with any fun flavor combinations. Finally, I would feel perfectly safe using this toothpaste with children. In fact, if you compare these ingredients to the fluorinated, SLS, propylene glycol, and even TRICLOSAN containing, artificially flavored and dyed toothpaste most people are using, I think you'll find this homemade version to be much less concerning. I would still encourage children to spit it out after brushing and only use a small amount WITH SUPERVISION! Equal parts coconut oil and calcium carbonate powder (for example 1 T of each) plus peppermint essential oil to taste. This is my new favorite way to make toothpaste! Quick and easy and you can make as much or as little as you want. Optional: Add boiling water if you prefer a thinner toothpaste or would like to put this into a squeezable container like this. When you add water, you have to be careful about mold, bacteria, etc. I'm sorry but I don't know the specifics, I just try not to add water! Right now we just dip our toothbrushes into the glass container we store this in. Sorry if that grosses anyone out, but it's just the two of us and I figure that we're getting the same germs anyway! Update: The recent controversy over the lead naturally found in Earthpaste and bentonite clay in general has got me a little freaked out. I am considering switching to a calcium carbonate base once I've used what bentonite clay we have left! Tip: Do not use metal utensils when working with bentonite clay! 1. In bowl, mix dry ingredients. 2. Add coconut oil to dry ingredients and stir. It helps if the coconut oil is heated to above 76 degrees so that it's liquid. Fun fact: you can tell if your home is above or below 76 degrees by checking to see if your coconut oil is liquid or not! The downside is that without water, the finished product will harden if it's kept in a room thats below 76 degrees. It doesn't bother us but be forewarned and know it's normal. 3. Add the tea tree oil and peppermint oil and stir well. 4. Store in an airtight container and enjoy brushing with your thrifty, effective, non-toxic toothpaste!